At the end of September we once again we flew from Frankfurt, Germany on the direct Lufthansa flight to Portland, Oregon, a little over a 10 hour trip, but for a briefer stay than usual. The last few years we've come home for a 10 week visit but this was to be a short, 5 week stopover. After over 7 months in Europe it was a welcome visit though the driving force for it was snapping-up the 100 lb weight limit needed for flying our bikes to New Zealand versus the 40 pound limit if we arrived from anywhere else in the world. Our bikes alone weigh over 40 pounds and the excess baggage charges on each leg of the trip would have had us bleeding money. Being back home is always a roller coaster ride of unexpected surprises and unwelcome obstacles. Definitely one of the elements weighing in on the positive side this fall was the weather. The usual formula for October in the Pacific Northwest = gray, overcast skies + intermittent downpours + chilly temperatures, but this year the equation read differently: October = sunny blue skies. Yes, we were lucky: the typical cold, wet weather only encroached on the sun a couple of days during our stay and there were only a few more days in which the clouds obscured the sun and dropped the temperatures but without a rain event. The phenomenal weather was especially welcome on our first days home to speed our jet lag recovery. Nothing like a blast of sunshine at 7 am in the new time zone to shout at the brain that something has changed and it better get with it. The beckoning sun also jumpstarted our new walking program--a program designed to complement our recent weight loss. When back home, exercise has always taken a back seat to more pressing matters and as a consequence, our fitness and wellness has suffered during this interval. For months this summer we distracted ourselves from the pangs of dieter's-hunger by strategizing as to how we would make things different this time. How would we make exercise a priority during our at-home time--an interval we wanted to be an exemplary model to follow when we finally give up our lives as cyclotourists. As most good solutions, the final answer proved to be exceedingly simple: we would walk and we would walk almost everywhere we went. We would walk for transportation; we would walk for fitness. The elegantly simple solution would save us hundreds of dollars in mileage fees we pay to borrow a car and would save the smaller sum we spend on bus fare. The high risk of bike theft had always made many errands unattractive by bike and with walking, there was nothing to park, nothing to be stolen. Walking for transportation would be the ultimate in time-slicing as the 2 hours a day that we targeted for exercise would be consumed getting us to appointments and markets most days. Surprisingly, the time to walk to many destinations in the 3 to 5 mile range was only about 10 minutes more than the time required by bus, especially if the trip involved transferring. Driving a car would of course be much quicker than either walking or taking the bus, but at a considerable out-of-pocket expense with the high price of gas. So we walked and walked some more. One of our first outings was for overdue massages, an excursion which came in just under 10 miles round trip. I was aghast--I'd never before considered walking that far in the city for a single appointment. Though compelled by the logic of it, I was also taken aback to realize that I had propelled myself into the realm of the homeless and the mentally ill--the only unpaid American subpopulations I knew that spent as many hours wandering the city streets as we were now doing. The first weeks I would occasionally burst out in giggles at the thought of walking to stores I considered too far away to drive to unless I also had other errands to do on the way. At night I'd pull out a city map and a tape measure to estimate miles to the next day's destinations. Those distances and what I knew of the grades were factored together with the 4 miles/hour walking pace we'd clocked on a local track. "Time to walk there" was now built in to my calendar for almost every appointment made. Almost all of our regular destinations for this abbreviated visit fell under the 10 mile-round trip point, with the few others clustering at 20 or more miles out and back. For most of those longer journeys, we rode our bikes as we had often done in the past as they were destinations where the risk of theft was low and the wonderful bike network shielded us from traffic. The great weather that greeted us literally helped us get out the door with our budding walking program as the sunny autumn days were irresistible--who wouldn't want to be out walking in weather like that. And the great weather kept us from being tempted by far less time efficient exercise programs, like going to a gym or doing training rides on the bikes. Bill treated himself to a pedometer with a pulse meter to keep his interest level up and I focused on taking a slightly different route each day for the entertainment value. We finally settled on a minimum of an hour and a half of moderate exercise a day, with 2 hours still being our goal that was often met. Almost every day we found ourselves walking 5 to 10 miles, often with a backpack of 5 to 10 pounds. Many outings to appointments across town would consume the heart of the day once we allowed time for an appointment at the turnaround point and shopping or other errands on the return trip--jaunts long enough to necessitate carrying extra clothing, water and some snacks. Bill reminiscing about his missing belly. While in the States, we could finally assign pounds lost instead of just inches lost to our 6 month weight loss program that our walking was now supporting, with Bill losing 30 pounds and me losing about half that. 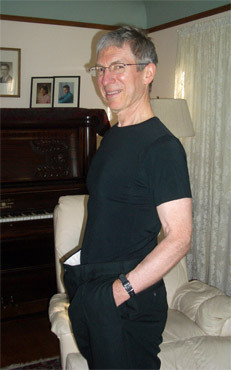 Bill's doctor was stunned at what he'd accomplished in 6 months and even told him to gain 10 pounds back. Given that Bill had been planning on dropping another 5 pounds, they finally settled on him keeping his weight where it was. His physician added that in addition to all of the metabolic, cardio-vascular, and joint issues Bill's new lower weight would spare him, that he'd also reduced his risk of cancer by 20%, an added bonus. In addition to those critically important but intangible improvements, Bill feels significantly better at his new, lower weight of 135 pounds. We knew he was walking and biking faster as his weight came down, but he also began realizing that he maneuvered around furniture when he was in a hurry with greater ease and was more energetic in general. One never knows how his or her changes will affect others and an unexpected consequence of Bill's weight loss was triggering fear in his sister that we were never coming back to the States again. Only a handful of items in Bill's old wardrobe came close to fitting him when we returned and so we hauled bag after bag of clothing out of the house to celebrate his new being. We had told her why the clothes were going out the door, but it still looked too final for her. Of course, it was intended to be final: Bill wasn't going to be that size again; but that wasn't the 'final' that she was concerned about. No doubt our new walking routine contributed to both of our major goals: keeping our fitness level up while not cyclotouring and maintaining our weight loss. We knew the temptations from being at home would be the next big challenge in our weight reduction program and we both exceeded our goal, which was to maintain our loss. Quite unexpectedly, we each dropped another 1-2 pounds while in Portland for 5 weeks. We now both feel confident that we'll be able to sustain our new weights whether we are traveling or not and have added a bonus of attaining a new ease in our bodies with long distance walking. One of the unexpected pleasures of being home in October, especially a dry October, was savoring the sight of the fall fruits on the trees. The leaves were turning, with the maples and staghorn sumacs being the showiest with their purples and reds. We were also dazzled by curious and brilliant fruits we'd never noticed before. Our 2004 traveling season in Britain was spiced up by buying a couple of tree identification books and this was our first chance to test our knowledge on species thriving in our locale by their autumn looks. We were surprised to find Indian bean and laburnum trees in the neighborhoods we walked, in addition to a single persimmon tree loaded with green fruit. Then there were the new-to-us Clarendendron (hopefully the correct spelling). A few still sported heavenly scented white flowers in early October while setting their seeds in blueberry-like pods framed with showy hot pink petals. And we were surprised to learn that it was a variety of dogwood that dangled single bright red fruits covered with spine-like structures. The crisp days with the crinkle of dry foliage rather than slippery gray leaves underfoot added to our walking pleasure, as did the stunning array of colors overhead. Ah, it was a fall to remember and we savored it hours every week as we walked and walked the tree-lined city streets and were warmed by the low sun. Purchasing electronics and then massaging and coaxing them to fit our needs is always a time consuming task for Bill during our homes stays and one he expected not to deal with this visit, but that was not to be. We shipped off our "baby", our laptop computer, for hardware repairs and after more than a week away from home, Fed Ex delivered her to our doorstep. The 3 pm Friday afternoon delivery was welcome to give us use of it on the weekend to resume printing photos but Bill quickly discovered that the service folks had created a few new problems, one being the elimination of the wifi feature which has become our primary means of accessing the internet. A hurried call to the service technician on the east coast before they closed for the weekend was not reassuring. They were clueless as to the source of the problem but suggested that Bill download a huge file to install on the computer--so huge that of course the best way to download it would be via wifi. After fretting and fiddling with the lame computer over the weekend while we got caught up on essential projects, we finally decided not to return the laptop for another repair. We risked not having use of it for almost half of our stay and also risked not having it returned before we departed for New Zealand if needed parts weren't on hand. We were also concerned that additional problems might be created by the service folks or the jarring of shipping. The third call to the service department reassured us that indeed the work would still be under our service contract if it was postponed until our return in March. And of course the deal-maker in using the compromised computer had been Bill's hurried purchase of an external wifi antenna over the weekend to substitute for the mysteriously disabled internal antenna. The external antenna added yet another rigid object to squeeze into our panniers but immediately validated its worth by delivering significantly better reception. Computer problems seem to be an inevitable problem for any owner and so to are beestings for cyclotourists as we usually get 1 or 2 stings between us each traveling season. But we were taken aback to be victims of an aggressive attack as we attempted to do a "walk through" at the home we still own but rent to others. Bill unwittingly stepped on a disintegrating stump that was their home and was stung 5 times on his feet and lower legs and I was stung once on the ankle. Screaming, we abruptly terminated our appointment with the new property management woman we had just met and flew down the hill towards a nearby supermarket in the car we borrowed for the outing. Unbeknownst to us, several of the bees were still in our clothing and swarmed inside the car as I drove. After stopping once to shoo out the remaining bees, I rushed into the market to buy 3 bags of frozen broccoli while Bill headed to the pharmacy for antihistamines. We sat for an half an hour in the lobby area of the Burlingame Fred Meyer store with our shoes and socks removed and the bags of frozen vegetables cooling our throbbing flesh. "Only in Portland" I thought could 2 respectable looking, graying adults sit on a bench in a grocery store with frozen vegetables on their feet and have no one give them a second look. 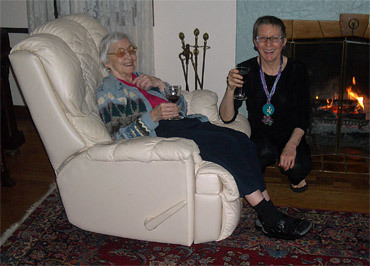 We were left to our misery and remedy in private, which was quite welcome. Bill's multiple stings had made him inconsolable with pain in the first 15 minutes but the injuries responded to therapy over the next few hours. My single sting however got worse and worse and I bought an elastic ankle brace the second hour to control the pain from the massive swelling. I was still icing and elevating my foot into the second week after the sting and still scratching it at 2 weeks. The last remnants of swelling only fully retreated almost a month later. The walk-through at the house had to be rescheduled and was to serve a dual purpose: we wanted both to see how the house was faring under the care of the second set of renters and the original property management firm and we wanted to reassess our attachment to the house. The close-to-town home set in the woods had been our residence for 15 years before we started traveling and Bill wasn't quite ready to let go of it then, enjoying the connection to the past that it provided. But after almost 6 years on the road, it no longer looked like a good fit. The bee event underscored the hassles of home ownership and the later walk through convinced Bill that he was now ready to let go. But the overbearing capital gains tax consequences won out over the desire to move on and we finally decided to not sell it now but keep it until we settle down again. The flurry of activity generated over a week's time by exploring tax loop holes, pricing downtown condo living, and authorizing more substantial maintenance projects on the property were all useful exercises that will put the topic to rest for a couple more years. We are often asked how much culture shock we experience when we return to the States and predictably it is less and less each year. The transitions to and from the US and Europe get easier each time we make them and now when at home our major shock the obsolescence of our information. Favorite stores have moved or closed; traffic flow changes; new retailers come on the scene --all which conspire to make us a bit dated. The one cultural adjustment we both found ourselves just barely making was not saying "Oh, you speak English" when talking to a clerk as our brains were still expecting to be greeted in German or Italian our first 10 days back home. Bill was also amused at not quickly recognizing a restaurant's clever name on a menu item as he was giving it an Italian spin in his mind. And there was a bit of halting in our conversations as we self-corrected before speaking so as to use the appropriate units of measure instead of the Euro's, kilograms, and kilometers that were on the tips of our tongues. One of the joys of being home is always indulging in flavors that are hard for us to come by when abroad, either due to scarcity, absurd prices, or our lack of ability to cook the items. Almost all are simple treats, like acorn and butternut squash, black beans, and corn tortillas. And local specialties like salmon are things we save for eating at home. In contrast, there are a few European treats we miss while home, like budget-priced dark chocolate, Italian peaches available months later than in the US, and luscious and cheap mandarin oranges and ready-to-burst persimmons in the winter. A disappointing cultural reminder was of the persistent litigiousness of our society, which was reflected by a grocer posting a warning sign in 2 languages about the hazards of buying Halloween pumpkins. No doubt some suit-happy customer had prompted the cautions regarding the risk of injury from lifting one of their pumpkins and the hazard created by the unexpected roll of a pumpkin--egad! An early holiday dinner with our families. We did little socializing while back home this fall. It was frustrating to say "See you in March" to so many lively get-togethers, but doing so gave us the extra time we needed in our compressed schedule. We focused most of our energy during this half-length stay on the chores necessary to get us to New Zealand and to ease our March return. Shopping is an important annual ritual when in the States as we take advantage of the lower prices by replacing most items in our basic wardrobe and parts of our cold weather and rain gear supply, as well as buying hundreds of dollars in higher quality bike parts. This being more of a mid-season stopover meant that most of the shopping was catching the sales and better inventory in the stores in the fall and stashing the items for next spring as much of our gear would make it through the next 4 months. In addition to the shopping spree, being back home is always a feast of resources for us. Doctors, dentists, and massage therapists solve problems and answer questions for us. A special outdoor gear repair shop (Mountain Soles) reinforces the stitching on our heavier items, like our fanny packs. Favorite outdoor and hardware stores make it easy to find special solutions to nagging equipment problems. Access to bleach, 409 cleaner, and scrub brushes allows us to deep clean our water containers, sandals, and other heavily used items. Having more kinds of tapes, glues, snaps, and straps gives us a chance to test out our new ideas for further customizing our gear. And the use of stored tools like drills and saws let us modify the even tougher materials in our small inventory. Having the bikes at home also meant that they could get a deeper cleaning that we can give them on the road and we could again have the technical conversation but in English as we bought another set of wheels to replace the second set of cracked ones this year. And at least Bill could then install the new parts, rather than hauling the pieces overseas with us in our luggage. Our list of sewing projects was shorter too, begin more limited to small items and minor alterations or additions, like sewing snaps on pants legs to keep them out of the chain grease and reinforcing our backpacks. I wrapped up most of my projects in a day and still had enough enthusiasm left over to begin experimenting with altering my State-side pants to fit my trimmer form. The big payoff for fewer social outings was more concentrated time to work on our single-largest project when at home: our photo album. It was a huge relief to get it completed 10 days before departure instead of as we were going on the door as in prior years. And at last, we finished up our 2002 album that we never quite had time for. Of course, each year we are getting more efficient and keeping fewer photos and customizing the photo size on our printer speeds the process too. A change of pace at the Portland Rock Gym. The album project was done early enough to allow indulging in some extra minutes to collect a few 'stats': we saved about 600 photos from our 7 1/2 months of travel and supplemented them in our album with about 45 post cards and brochure clippings. We always knew the album format we used was heavy and indeed this most recent one weighed about 16 pounds. But it could be worse as we estimate that we retain and print about 20% of the photos taken with our digital camera. Squeezing in time for a 3 hour introductory course at the Portland Rock Gym was a special treat for Bill. Our wildly successful Via Ferrata hikes in the Italian Dolomites this summer left us both hungry for some training in climbing skills with English as a first language speakers. 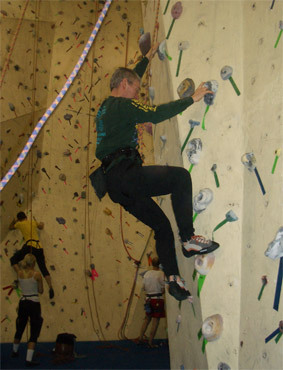 Unlike on the Via Ferrata, the focus at the Rock Gym was on working in pairs, with 1 person managing the belay rope while the other scrambled up the indoor wall. Good fun and of course it offered the opportunity to work on our always-wanting upper body strength in a playful way. And better yet, a brisk round trip walk to the Gym clicked off the first hour of our daily 2 hour exercise goal for the day. Thrilled with the opportunity to get instruction from a native English speaker, we indulged in a 2 hour techniques class to round out the experience shortly before we left town. Our last days before departure went better than ever before. Bill keeps enhancing his organizational skills for managing his time at home which makes life calmer for both of us. Each year he finds it a little easier to establish the priorities early on and to draw the line on what won't get done as the departure day draws nearer. Stashing bike boxes for the impending & future flights. Last minute trips to the dentist seem to be a part of Bill's routine at home, and this time was no exception. Too much damage to gum tissue during a tooth a repair had left Bill thinking he had an abscessed tooth 2 days before flying. An eleventh hour visit to the dentist was reassuring and topical antibiotics were expected to solve the superficial problem. Our friend Mulvey gave his newly purchased Volvo station wagon a work-out on our behalf with picking us and our bikes up at the airport and delivering us all back again 5 weeks later. 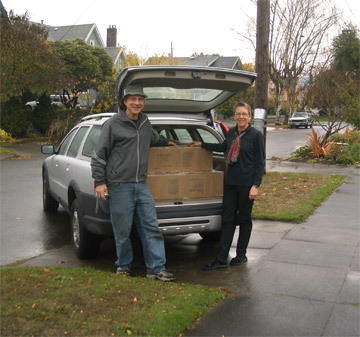 He even made a special run in our last week to shuttle a haul of bike boxes to us--2 for our trip to New Zealand and a half dozen for future trips. Bike boxes are always a hassle to procure. The bike shops give them away for free but they are so small that Bill spends hours dismantling the bikes to fit them in, even though we expand them a bit by using 2 boxes per bike. The airlines will sometimes sell larger, roll-in boxes, but it's quite the shell game dealing with them. They don't always have them on hand and won't let customers reserve them, so we don't dare show up on departure day without our own. And the rules are always changing: now Lufthansa, the carrier we fly to Europe, doesn't want bikes in boxes. 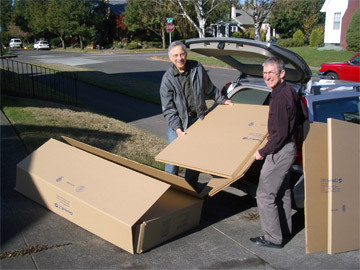 The boxed bikes just fit in Mulvey's wagon..
We were lucky with the weather this year as we had many dry, sunny days--not your typical Pacific Northwest October. We would have felt even luckier if we had left Portland a day earlier. As it was, we departed under heavy gray skies and intermittent downpours. The newspaper had predicted that this would be the day winter arrived as it was the first of 9 consecutive days of rain. They were predicting 2-3" inches of precipitation in that length of time, though that much water was expected to fall on the coast in a single day. Our early arrival at Portland International Airport again reminded us of what a lovely place they have created for travelers. Calm spaces and colors combined with live plants here and there make for a wonderful interlude in the "hurry-up and wait" process of traveling. And the free wifi and ample supply of electrical outlets for our laptop added to the pleasantness of the beginning of a long journey. The security screening process seemed more organized and efficient than the few other airports we've been in lately, further enhancing the overall departure routine. And we were surprised to see that the level of cooperation among travelers in solving overhead bin stowage problems on the plane was far above that we've seen overseas--yet another little reminder of the comforts of being in our own culture. We lamented that LA's international airport where we laid over 5 hours before boarding for Auckland wasn't as sweet as Portland's. We did enjoy walking in the warm sea breezes just before sunset, covering the length of the airport grounds in an hour and doing a few laps on a staircase. We then headed inside to the not-so-inviting spaces to corral one of the 5 electrical outlets we could find for power-hungry computer users. But at least we were on our way to New Zealand with the bikes without any new headaches. We are on the east coast of New Zealand's North Island, beginning our 4 month tour of the country. The general plan is to bike from Auckland where we landed to the east coast of the North Island, then head south and do a loop around the South Island and work our way back to Auckland for our March 1 departure to Portland. New Zealand is amazingly well set-up for travelers and the locals don't seem to have tired of them yet. Our biggest disappointment was that it appears we'll have to make reservations for each night's stay several days or a week in advance--something we rarely do--and it would be necessary even if we were camping. Oh, and the weather--it looks like wind is a certainty most every day and some rain is almost as likely.